Kleenex® Mansize Tissues are extra large and extra strong, ideal for anything life throws at you. Lightly compressed into a small box to fit into lots of places. They are our most versatile tissue and big enough for the whole family. 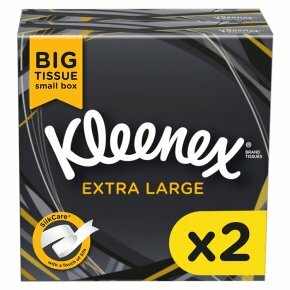 Contains 2 x 50 Mansize tissues. Kleenex® Mansize Compact Tissues. Twin Box. Confidently strong. Comfortingly soft.Kleenex® Mansize Tissues. Sometimes we need a little softness with our strength. Kleenex® Mansize is comfortingly soft and strong so you can be confident it won't let you down. Kleenex® Someone needs one.